Fairly extensive graphics settings, with a good amount of configuration files for fine tuning. Official modding tools are available. Nvidia Ansel has been added to the game, essentially functioning as a built-in photo mode. Initial retail release requires the launch file. Launch file requirement removed in later retail releases. Patches and DLC are only available by activating on GOG.com. Game of the Year Edition also available. The client always downloads the complete set of bonuses when installing the game. All the digital distribution versions come with free bonuses that include the soundtrack in MP3 and FLAC formats. 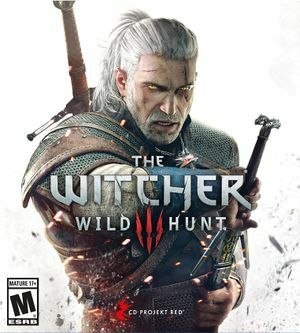 All versions of the game can run without GOG Galaxy and do not require any type of authentication, activation, or digital distribution software. The initial 2015 release has 4 DVDs, while the 2016 Complete Edition release has 6 DVDs. Includes Hearts of Stone and Blood and Wine. The retail release requires a launch file to play. Further patches require activating on GOG.com. Extract the contents of the archive to <path-to-game>\mods\. It will autoskip loading screen videos (which you can also skip by pressing space). Supreme to Extreme Graphics Options aims to give players extended in-game graphics settings for beyond the bounds configurations. This mod goes beyond of what the now deprecated Witcher 3 Config Tools was able to achieve. As alternative UGOM can be used instead as a more advanced in-game menu. Both mods can be a extremely heavy task for the GPU. The Witcher 3 HD Reworked Project aims to improve the graphics by reworking models and textures to better quality. LOD NPC is a mod that significantly increase Level of Detail at distance of NPCs. The mod also forces the constant use of high definition models at distance. Next Generation LOD is a mod that significantly increase the average Level of Detail at distance of the game. This mod significantly decrease Pop in caused by the distance based model swap of the game. It also fixes the vanishing sails of the games' various ships. Increased Draw Distance is a mod which, as the name states, increases the overall draw distance of the game. It is useful to complement LOD mods, such as Next Generation LOD, which are incomplete in their modification of the game world's draw distance. The Nitpicker's Patch is a community mod with a massive collection of fixes that resolves a variety of bugs and visual glitches. NPC Physics 60FPS FIX is a community mod that fixes hair, fur, clothing, medallions, weapons, etc, behavior when the game runs at different than 30 fps speeds. The mod was build to run with the E3 Geralt Hair Physics 60FPS FIX that fixes the same problem on Geralt's non-hairworks hair. The Realistic Weather is a mod that tweaks the dynamic weather of the game. This mod acts almost like a DLC for the main game and improves immersion without changing the original vision of the game. The Dense Rainfall will increase the drop count of the rain. This mod gives much more accurate rain effect. See Widescreen resolution for setting a custom resolution if needed. Cutscenes are 16:9; use patched .exe. Default is 60°. See Field of view (FOV). Controlled by Texture Quality setting. Low is 1x, Medium 4x, High 8x and Ultra 16x. 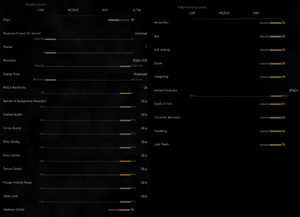 FPS cap can be configured to 30, 60 or unlimited in options menu. Xbox One S/X and PS4 (Pro) only. Improves visibility of tracks, marks, footprints and scent clues. Open %USERPROFILE%\Documents\The Witcher 3\user.settings with a text editor. Find Resolution=XXxYY and set your resolution (e.g. Resolution=1152x648). If you want to use a resolution lower than 1024x768, also find FullScreenMode=X and Change X to 1 or use borderless mode. Download FOV Slider and Custom Localization Fix. Extract modFOVSlider\ and modCustomLocalizationFix\ to <path-to-game>\Mods\. Extract modFOVSlider\bin\ and modCustomLocalizationFix\bin\ to <path-to-game>. Start the game and set the FOV using the slider in the options menu. Going over 89 will break interior lighting and cause severe rendering/performance issues. Game uses Hor+ scaling with vertical measurement; 89/90 is equivalent to 119/120 and fine for people who like the widest FOV in games. If you like 110 or 100 or 90, then you want 80 or 70 or 60 respectfully. Game uses SSAA for cutscenes, but has no edge smoothing during gameplay. Since version 1.04 all keys can be remapped. Under Video Options, enable Hardware Cursor to disable mouse acceleration. Can only be changed if Hardware Cursor is disabled. You can enable it again after you change the sensitivity. XInput, Xbox One Controller and DualShock 4. 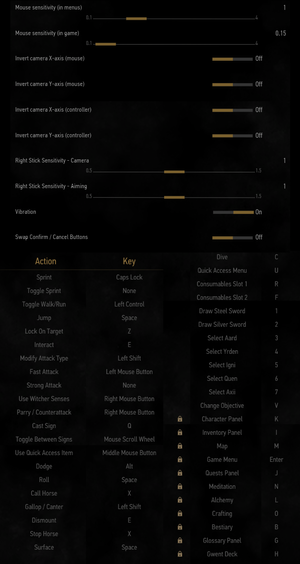 Possible by editing the input.settings file or with mods, some are available on the Nexus. Rapidly changes button prompts. Enable Steam Controller support here. Master, music, effects and voice. Up to 7.1 (no in-game option). Loading screens and cinematics (FMVs) do not mute on focus lost. See Helix Mod: The Witcher 3: Wild Hunt. UI is 2D by default, occasional rendering problems with distance shadows and decals. Go into the <path-to-game>\DLC\ folder. Make sure there's no folder named "DLC" in it, there should however be folders named "bob", "ep1" and "DLC1-16". This can be the result of trying to install a mod using the NMM and instead of placing the mod files in <path-to-game>\DLC\ it creates an extra folder. Set game frame limit to Unlimited in the Video Menu. 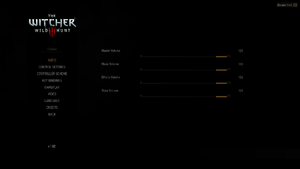 Open %USERPROFILE%\Documents\The Witcher 3\user.settings with Notepad and look for a line called "limitfps". Set it to anything that is above 30 but below 60 (for some reason 30 and 60 locks cause stutter) eg. 31-59. Even on high-end GPUs, it is possible to experience choppy framerate when in Novigrad or other large cities. Frame rate capping can provide a fix. You can also limit framerate in the in-game graphical options menu, but this may lead to stutter. It is advised to set this as Unlimited if framerate limit is configured via external program. Prior to patch 1.21, framerate drops and stutter may be caused by the game triggering the garbage colector all the time to save VRAM. To alleviate this simply navigate to <path-to-game>\bin\config\base and open gc.ini. Then find the line with "ObjectMemoryTrigger" and change it's value to 512. In most cases this will fix stutter in novigrad entirely. There is no known way to tweak GC after patch 1.21 because it was redonne from scratch. Now GC will regulate itself based on user's machine. Other known way is navigating to your <path-to-game>\bin\x64 folder and simply deleting the APEX_ClothingGPU_x64.dll file there has been known to solve some stuttering issues and improve framerates for multiple users ever since launch. This occurs on Kepler GPUs due to issues with certain Nvidia driver versions. Open %USERPROFILE%\Documents\The Witcher 3\input.settings with a text editor. This alters the delay to trigger alternative casting mode from 20ms to 5ms. For 16:10 change the value of uiVerticalFrameScale to 1.1253. For 21:9 change the value of uiHorizontalFrameScale to 1.3125. If your aspect ratio is vertically greater than 16:9 increase the value of uiVerticalFrameScale above 1. If your aspect ratio is horizontally greater than 16:9 increase the value of uiHorizontalFrameScale above 1. Stutter occurs because the game rapidly changes between controller and keyboard prompts. This forces the game to use controller prompts. There won't be any keyboard prompts even while using keyboard controls. Right Click on witcher3.exe and select Properties. Under settings select "Disable fullscreen optimizations" and click OK to save the changes. Start The Witcher 3 and make sure Fullscreen is selected and not Borderless Fullscreen under video options. Nvidia PhysX Makes use of some Nvidia-accelerated effects that may cause slowdown on AMD GPUs. Many visual and gameplay mods can greatly improve a first-time experience without appreciable drops in framerate or drastic changes to gameplay mechanics. The Witcher 3 photo mode can be achieved by using internal console command. Camera angle and game condition (time of day, weather, pause/resume, etc.) can be manipulated as needed (also works while in realtime cutscene). If you have an Nvidia GeForce graphics card, you can use Nvidia Ansel as an alternative—allowing you to take screenshots with an extremely high resolution or 360° field of view. You can also add extra post-processing effects. Ansel can be activated by pressing Alt+F2 while in game. Enable instant sign casting so you don't have to use the radial menu (you don't need the mod files, just follow the instructions on the page). Download the most recent version of Windows AMD drivers - performance boost. Change MovieFramerate to which you desire (e.g. 60 or 120). Add MovieUbersampling=false under [Visuals] section. Add MotionSicknessFocusMode=true under [Gameplay] section. Open The Witcher 3 Wild Hunt\bin\config\base\general.ini with a text editor. Add DBGConsoleOn=true under [General] section. Set Tessellation Mode to Override application settings. Set the Maximum Tessellation Level to either 2x, 4x, 8x or 16x. Set the Maximum Tessellation Level to either 4x, 8x or 16x. Can be useful for Steam Controller users who own the GOG edition, and want to use the Steam controller overlay while being able to get GOG achievements and track gameplay hours. GOG.com and Steam use the same overlay short cut "Shift+Tab", so if you want choose which to access change the keys for one of them to something like "Shift+F1"
↑ 1.0 1.1 File/folder structure within this directory reflects the path(s) listed for Windows and/or Steam game data (use Wine regedit to access Windows registry paths). Games with Steam Cloud support may store data in ~/.steam/steam/userdata/<user-id>/292030/ in addition to or instead of this directory. The app ID (292030) may differ in some cases. Treat backslashes as forward slashes. See the glossary page for details. ↑ The Witcher - Patch 1.05 for PC out now! ↑ The Witcher - Patch 1.04 for PC out now! This page was last edited on 30 March 2019, at 02:27.